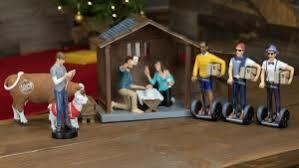 Results for - The Modern Messiah: Updated Nativity Scene -- Are You Offended? This year’s manger at St. Joseph’s Oratory in Montreal, Quebec definitely isn’t your traditional nativity scene. The ‘modern’ take on the Christmas tradition features Joseph taking a selfie with a coffee-toting Mary and Baby Jesus. Meanwhile, the three wise men, some of whom have ironic moustaches, are posed on Segways, carrying their latest orders from Amazon. The manger itself got a new look, with solar panels decorating the roof. Even the cow is labelled as being 100 per cent organic. The creator of the scene said that while the piece is meant to be humorous, they also wanted to make a point about what the modern immigrant experience can look like. Does this offend you? 1. The Modern Messiah: Updated Nativity Scene -- Are You Offended?